Minarik Drives' new micro-based micro-sized drives are changing the way OEMs look at small low voltage DC motor and drive application. These incredible small microprocessor based drives provides both speed control and current limit at a low cost. OEMs are implementing these drives in applications that did not traditionally use a drive. 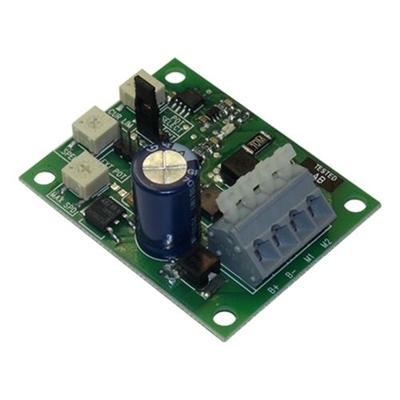 Many small low voltage DC motors are run directly off a power supply or battery. This method does not provide efficient speed control or reasonable current limit, two critical items that are achieved by this new line of drives. The drive pays for itself when it protects the motor just once from burning up because of a jam. IR comp can be customized for OEMs to allow for much better speed control and regulation compared to systems not using a drive. The drives contain Speed and Current Limit trim pots on the board. These units can also control speed with a remote pot by ordering the drive with the onboard speed pot removed and replaced with a header. A diode is included on the drive to protect against damage from hooking the drive up to a battery or power supply backwards. The small size and low cost of these drives make them a great choice for OEMs using small geared and non-geared DC motors. Review HTL Series for applications that require a 115 or 230 VAC input. User adjustable calibration pots: Speed and Current Limit. Current Limit: Limits the torque so gears are not stripped in an overhead situation. Microprocessor based design: Allows quick turnaround for custom units. Reverse polarity protection: The drive is not damaged when connected to the battery or power supply backwards. Ideal for battery powered equipment: Maintains both set and/or variable speed control even as battery voltage declines. Extends total running time of equipment. -0964: Spec models ending in -0964 allow for the connection of a remote speed potentiometer, replacing the SPEED trim pot on the board. RoHS: Models DC1.5-12, DC1.5-24, DC2.0-12 and DC6-12/24 are RoHS compliant.